Winter Solstice just passed in the Northern Hemisphere, meaning our daylight hours will start to grow longer. My friends in the Southern Hemisphere are honoring the longest day of the year. Meanwhile, San Jose’s fairies are celebrating the arrival of several wet storms, a welcome pause in our very long drought. And for those of you feeling the winter blues, just think: The first day of spring is just three months away. Look who has a bright red scarf for the holidays? There are a couple of reindeer on the roof. The rest of the team must be on a coffee break. 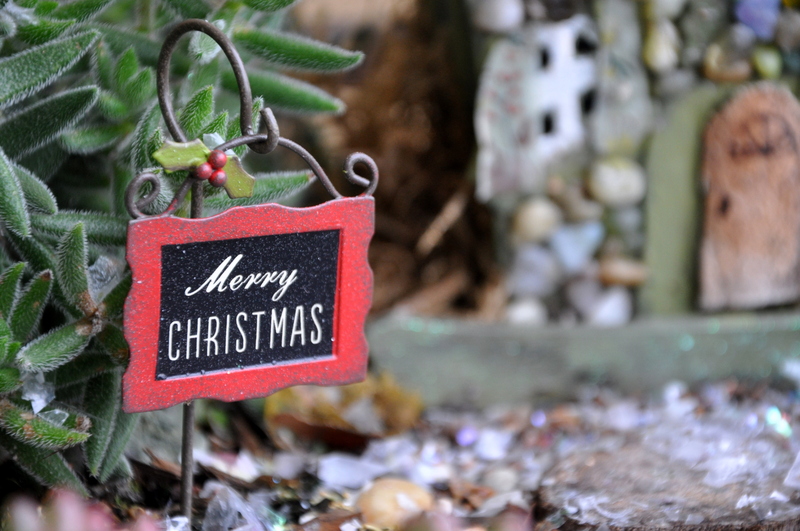 This entry was posted in Fairy Garden and tagged fair garden Christmas, fairy garden, Northern Hemisphere, southern hemipshere, Summer Solstice, Winter solstice. Bookmark the permalink. Happy Winter Solstice to you! I am sways surprised to realise the longest day is in December, when we just seem to have got going with Summer. I guess it must be a relief for those who have the long cold, dark days of Winter. 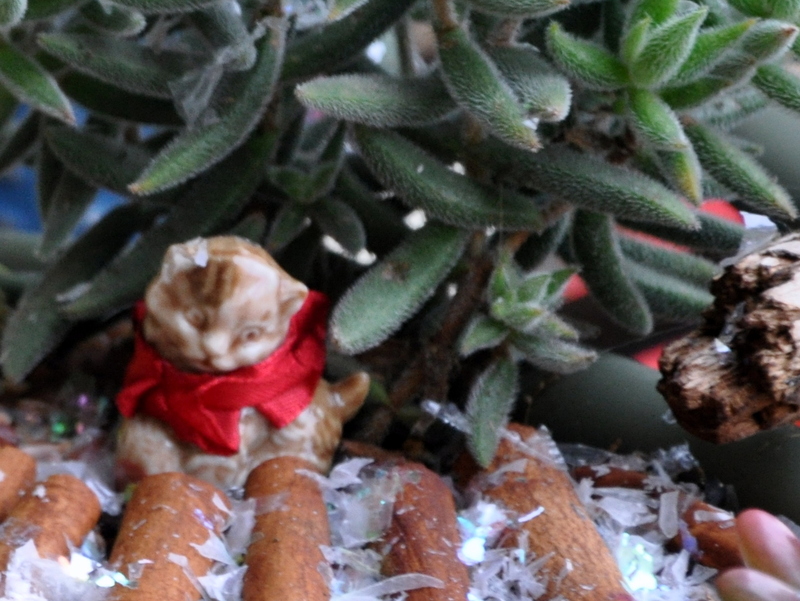 Your fairy house is delightful, and the red scarf gives the extra touch of joy. Thank you, Anne! I’ve really learned a lot since blogging about the two hemispheres and the difference in celebrations. It’s one of my favorite things about blogging, too. I love learning about people and cultures. Isn’t it interesting to see how individual people celebrate within those cultures? How we are all the same, and yet oh so different. Yes! And if could focus on our sameness, how much better this world would be. Imagine. Dawn, Merry Christmas and Happy New Year. I’m so glad to have found you via your blog this year. Have you picked your word for 2016? Thanks, happy Christmas for all of you. Happy Christmas to you, too. Thank you, Cindy. Merry Christmas! Thank you, Johanna! Happy Holidays! Magical. Glad to hear you’re having some rain.. Merry Christmas and best wishes for the new year! Thank you, Lisa. Merry Christmas. How fun–your fairies know how to celebrate the season! Wouldn’t you know it, as soon as you take out your lawn and put in drought tolerant plants, you get more rain than you’ve had in forever? You single handedly ended the drought. 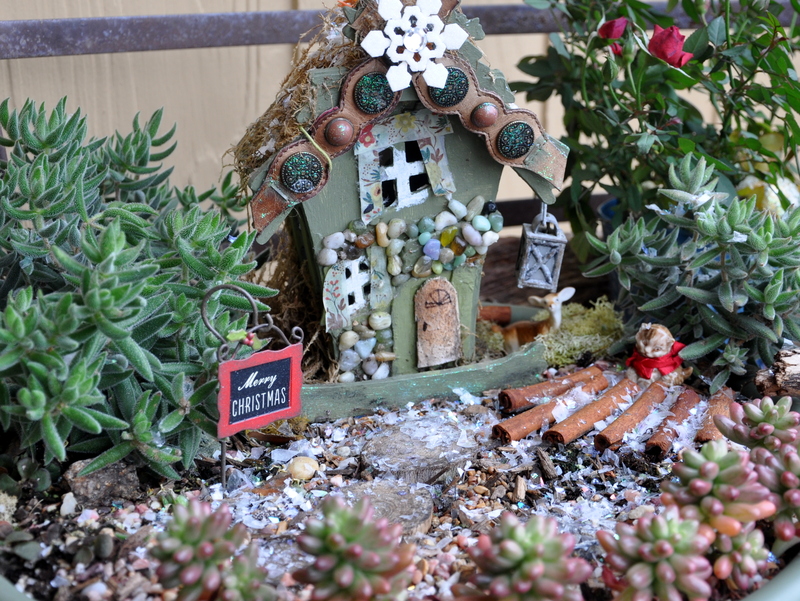 🙂 I love the festive look of your fairy garden. Are those cinnamon sticks used to make the road way? Wish the fairies a Merry Christmas for me. Hugs to you. Oh how I wish that were true, Marlene. I could send myself around the world, ending droughts everywhere. Those are cinnamon sticks (non-edible from a craft store). You have a keen eye. They’re supposed to discourage the squirrels from digging up the small plants, but our squirrels are indifferent to the scent and unearthed some plants a mere hours after I laid the path. Ha! That will teach me to try to outsmart them. The fairies send their well wishes. If you feel a slight breeze over your shoulder, that’s them blowing fairy kisses. 🙂 That’s what that breeze was! 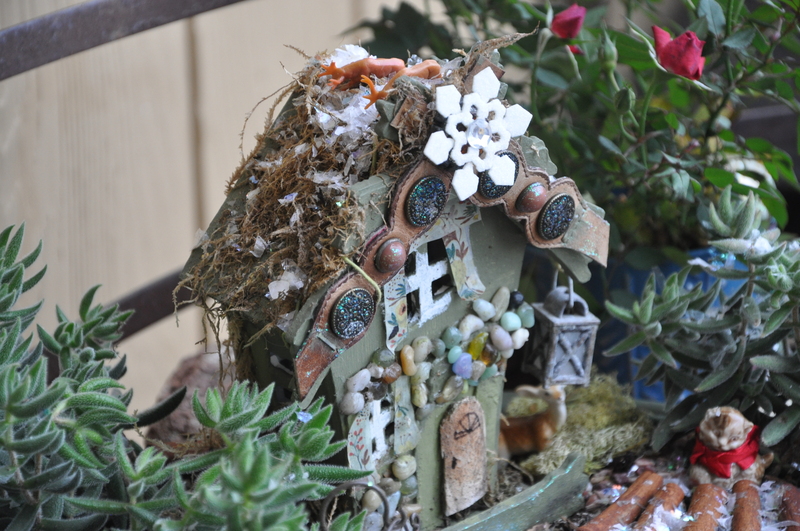 Those ornery little dickens should know better than to mess with the fairy house. Of course the fairies love their animals so they won’t be too angry. Giant hugs. Your fairies must be wrapped up nice and cosy in front of their fire inside…. I love the logs – are they cinnamon sticks? The same to you, Cathy. It’s Christmas Eve here now, so you’ll no doubt be fast asleep. Merry Christmas. and to you good wishes for the coming year. That’s a wonderful image, Cathy. I think you’re right. And yes, the logs are cinnamon sticks. Fun, eh? Oh geez, wet storms? I hope it was more ‘wet’ than ‘stormy’. Although I do enjoy a good ol’ thunderstorm. Ka-Boom, one-one thousand, two-one thousand…..Crack! Flash! Squeal! Did you know? That’s how you tell how far a storm is from you, count down from the thunder to the lightening crack. Boomdee the meteorologist here, ha! I’m sure there’s a more scientific way on the internet….probably some Google Doppler Radar thingy. Your garden kitty is wearing a scarf ! How adorable are you? Brrrrr, all that chilly snow laying about, it’s a bit cold on kitty toes. Speaking of chilly kitty toes, Simons Cat has an adorable animation of kitty heading out to the winter garden and doing battle with a funny little bird. It made me laugh, this cat is a hoot. San Jose got the wet, but other parts got the windy which did cause a lot of damage (downed trees, downed power polls). We didn’t lose power, so that is always a plus. We so rarely get thunderstorms because we live in a valley. I think we’ve had two storms with thunder in the past 12 months. I’m glad you are catching up on rest. It sounds perfect. Must check out Simon’s Cat. He’s brilliant and usually has me laughing outloud. Thank you, Helen. The El Nino conditions are expected to bring heavy rains in January and February. What we really need is gentle rain every day for six months, but the weather will do what it will do. I’m looking forward to more rain, but hope the floodgates remain closed. I hope you’ve had a pleasant Christmas (we have, very low key and nice). Do you celebrate Boxing Day? We have Boxing Day here, if that is what you mean. Now, it has become the first day of the ‘January’ sales, and I must admit that I will be taking advantage of it to find a new pair of boots. We’re also going for a post-Christmas lunch. Then it will be down to see my parents for a few days on Sunday. Sounds like a nice, full day. Did you find yourself a pair of boots? Just as I went east down the motorway, though, instead of going to the city centre as it was under about three feet of water. This was caused by the freak rain we’ve had over the last month leading to extensive flooding with most rivers bursting their banks and flood defences failing. So unfortunately not the happiest Christmas in the North of England and southern Scotland. How Fairy Splendid. 😉 Do hope the rain blessed you and it will be kind to you in 2016. Happy New Year.